The Charm EZ-M system was the feed & grain industry’s first available combined incubator and reader. The Charm EZ-M reads any quantitative ROSA mycotoxin strip used for grain testing including tests for aflatoxin, DON (vomitoxin), fumonisin, ochratoxin, T-2 / HT-2 toxins, and zearalenone that are GISPA certified for multiple commodities. Each of these mycotoxin tests has a different color strip for automatic identification on the Charm EZ-M system. Testing is so fast and simple that many facilities use the Charm EZ-M system to perform real-time analysis on raw ingredients as part of acceptance testing. By screening grains in the receiving area, food manufacturers can be assured that raw materials are of an acceptable quality. Is fully customizable to meet your facility’s needs. Only the tests, commodities, and dilutions for the specific detection levels you run appear. 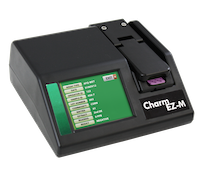 Use to incubate and read tests; or, to perform batch testing, externally incubate multiple tests and read results in the Charm EZ-M system. Will self-diagnose common errors, such as re-running the same strip or adding too much sample. Provides data redundancy and convenient transfer to external computers. The internal memory backs up 8000 test results; the SD card stores over 100,000 test results. Results are transferred to a PC using a standard USB cable, wirelessly, or with the SD card reader. Results can also be transferred to a LIMS network. Is configured in your choice of languages.